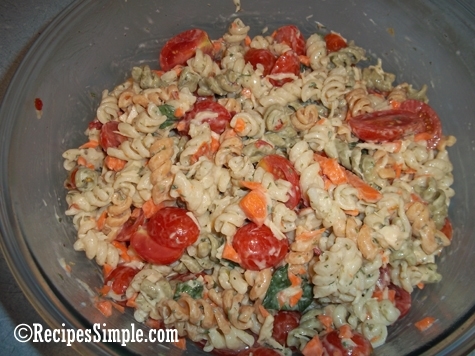 This classic pasta salad is great served with hamburgers and hot dogs. Add chicken and it can also be the main dish! It’s a quick and easy meal when you are in a hurry. I always prepare it the day before and let the flavors mingle overnight. I like to take this for lunch the next day if we have any leftovers! Empty pasta into 3-quart saucepan that is 2/3 full of boiling water. Gently boil uncovered for 12 minutes, stirring occasionally. Drain pasta and rinse with cold water. In small bowl stir contents of seasoning mix (from Suddenly Salad box) and the ranch dressing. In large bowl add pasta and remaining ingredients. Add the seasoning mix, stirring until well blended.